Remote sensing is the acquisition of information about an object or phenomenon by a device located a considerable distance from the object or phenomenon. The term was coined in the mid-1950s by an Office of Naval Research scientist to distinguish the information obtained from the first generation of meteorological satellites from that which had been traditionally obtained by airplane-based aerial photography. In practice, however, information obtained from high-flying reconnaissance aircraft such as the U-2 and SR-71 can also be considered to be a product of remote sensing. water pollution, and other attributes that can be characterized in terms of spectral reflectance. Paired images can also be used to stereoscopically construct digital elevation models (DEMs), which can subsequently be transformed into topographic maps or three dimensional terrain models from space. Other satellites contain active sensors that generate their own electromagnetic signals and record the reflections rather than passively recording reflected natural radiation. Synthetic aperture radar (SAR), in particular, is a useful tool because it can penetrate clouds and be used at night. The length of a radar antenna is known as its aperture and, in general, the resolution of a radar image is proportional to antenna length. The term synthetic aperture refers to a technique in which the constant movement of a satellite is combined with periodic radar pulses and computer processing to achieve the same effect as would be obtained by using a very large antenna. 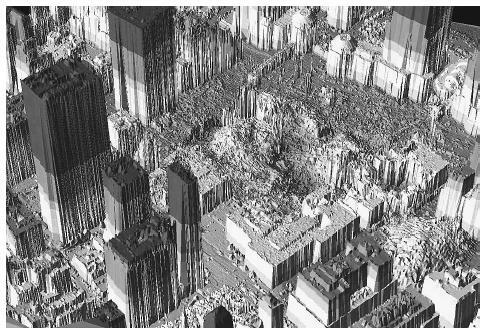 Pairs of SAR images can be combined to produce interferometric (InSAR) images that portray millimeter to centimeter scale changes in the elevation of Earth's surface. InSAR is becoming an increasingly important tool for monitoring tectonic movements of Earth's crust, subsidence associated with heavy groundwater pumping, and other geologic processes. It can also be used to construct digital elevation models. Another active source remote sensing technique is light detection and ranging (LIDAR), which is similar to radar but uses a laser instead of radio waves to produce extremely detailed topographic maps and images. It is generally understood that remote sensing satellites must have a resolution of 5 meters (m) or less to be useful for intelligence work. The Landsat 1 satellite, launched by the United States in 1972 and from which imagery was freely available, had a resolution of 80 m. Landsat 7, launched in 1999 and still in service, has resolutions of 15 m for panchromatic images, 30 m for its six multispectral bands, and 60 m for its thermal band. The French SPOT 5 satellite offers commercially available images ranging in resolution from 5 m for panchromatic to 20 m for infrared. Publicly available images with these coarse resolutions are useful for such tasks as delineating large-scale geologic features, evaluating inaccessible or denied terrain, examining land use patterns, and inferring levels of crop stress, but not for detailed intelligence work. In recent years, however, commercial remote sensing satellites have been able to obtain high-resolution images that are of intelligence quality. The commercial Quick Bird satellite launched from Vandenberg Air Force Base in late 2001, for example, provides commercially available imagery with 61 cm panchromatic and 2.44 m multispectral resolution. The commercial IKONOS satellite, launched in 1999, can produce 1 m resolution color images. Even the best publicly available imagery does not approach the resolution provided by classified intelligence satellites. The earliest KeyHole intelligence satellites (KH1 series), the first of which was launched by the United States in 1960, had a resolution of 2 m. Photographic film from KeyHole satellites was recovered using film drops until 1972, when digital imaging and transmission were instituted. The KH12 series is estimated to have a resolution of approximately 2 cm, although no images with this resolution have been released. Intelligence-quality images with sub-meter resolution can be used to assess details of troop or materiel movement, the progress of construction projects, and war damage in denied or otherwise inaccessible areas. Perhaps the most widely known application of remotely sensed images for intelligence work was the use of satellite and U-2 airplane photographs to detect the presence of Russian missiles in Cuba, which led to the 1962 Cuban missile crisis. Campbell, James B. Introduction to Remote Sensing, 3rd ed. New York: Guilford Press, 2002. Hardin, R. Winn. "Remote Sensing Satellite Market Pits Industry Against U.S. Policy." OE Reports. May 1999. < http://www.spie.org/app/publications/magazines/oerarchive/may/may99/cove 1.html > (November 14, 2002). Short, Nicholas M., Sr. "The Remote Sensing Tutorial." NASA. October 22, 2002. < http://rst.gsfc.nasa.gov/ > (November 14, 2002). Skorve, Johnny E. "Using Satellite Imagery to Map Military Bases of the Former Soviet Union." Earth Observation Magazine. April 2002. < http://www.eomonline.com/Common/currentissues/Apr02/skorve.htm > (November 14, 2002). International Society for Photogrammetry and Remote Sensing, Department of Geomatic Engineering, University College London, Gower Street, London WC1E 6BT, United Kingdom. 44 207679 7226. < http://www.isprs.org/. > (November 14, 2002).